With the government of Greece seemingly at a loss as to how to handle its migrant crisis, it is dismaying to discover that the major NGO whose mandate is to provide humanitarian aid to immigrants is instead profiting from smuggling them. Emergency Response Centre International (ERCI) describes itself as a "Greek nonprofit organization that provides emergency response and humanitarian aid in times of crisis...." It has reportedly abetted the illegal entry into Greece of 70,000 immigrants since 2015, providing the "nonprofit" with half a billion euros per year. ECRI evidently received 2,000 euros from each illegal immigrant it helped to enter Greece. In addition, its members created a business for "integrating refugees" into Greek society, granting it 5,000 euros per immigrant per year from various government programs (in education, housing and nutrition). On August 28, thirty members of the Greek NGO Emergency Response Centre International (ERCI) were arrested for their involvement in a people-smuggling network that has been operating on the island of Lesbos since 2015. According to a statement released by Greek police, as a result of the investigation that led to the arrests, "The activities of an organised criminal network that systematically facilitated the illegal entry of foreigners were fully exposed." "[A] Greek nonprofit organization that provides emergency response and humanitarian aid in times of crisis. ERCI's philosophy is to identify the gaps of humanitarian aid and step in to assist in the most efficient and impactful manner. Currently ERCI has 4 active programs working with refugees in Greece in the areas of Search and Rescue, Medical, Education and Refugee Camp Coordination." In spite of its stated mission and non-profit profile, however, ECRI -- according to Greek authorities, has earned considerable sums of money from its serving as a conduit for illegal activities. ECRI evidently received 2,000 euros from each illegal immigrant it helped to enter Greece. In addition, its members created a business for "integrating refugees" into Greek society, granting it 5,000 euros per immigrant per year from various government programs (in education, housing and nutrition). ERCI has reportedly abetted the illegal entry into Greece of 70,000 immigrants since 2015, providing the "non-profit" with half a billion euros per year. This revelation, however, does not begin to cover the extent of the illegal activities surrounding the entry of migrants into Greece. 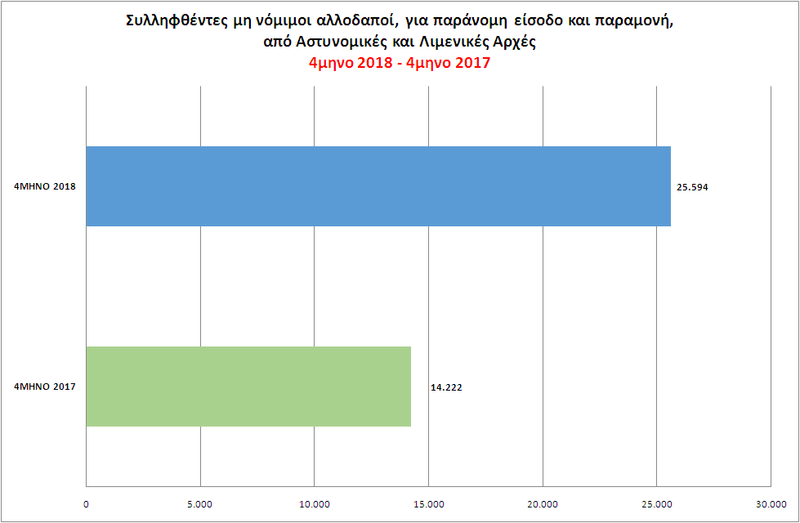 In 2017, for instance, Greek authorities arrested 1,399 people-smugglers, some under the cover of "humanitarian" operations; and during the first four months of 2018, authorities arrested 25,594 illegal immigrants. More worrisome than the literally steep price paid to people-smugglers by the immigrants themselves -- or that doled out by the Greek government in the form of integration subsidies -- is the toll the situation is taking on Greek society as a whole. In a recent heart-wrenching case on August 15, a 25-year-old college student from Athens -- on a visit home from his studies at a university in Scotland -- was murdered by three illegal immigrants while he was out touring the city with a female friend from Portugal. The three perpetrators, two Pakistanis and an Iraqi ranging in age from 17 to 28, told police that they first attacked the young woman, stealing money, credit cards, a passport and a cell phone from her purse, but when they realized that her phone was "old," they went for the young man's phone, threatening him with a knife. When he tried to fend them off, they said in their confession, they shoved him and he fell off a cliff to his death. After the interrogation, it transpired that the three killers were wanted for 10 additional robberies in the area. In an angry letter to Greek Prime Minister Alexis Tsipras, members of parliament and the mayor of Athens, the mother of the victim accused Tsipras of "criminal negligence" and "complicity" in her son's murder. "Instead of welcoming and providing "land and water" to every criminal and dangerous individual with savage instincts," she wrote, "should the state not think first of the safety of its own citizens, whose blood it drinks daily [economically]? [Should the state] abandon [its citizens] to ravenous gangs, for whom the worth of a human life has less meaning than the value of a cell phone or a gold chain?" Two days earlier, on August 27, approximately 100 immigrants, protesting the living conditions in their camp in Malakasa, blocked the National Highway for more than three hours. Drivers stuck on the road said that some of the protestors went on a rampage, bashing cars with blocks of wood. To make matters worse, police on the scene said that they had not received instructions from the Ministry of Citizen Protection to clear the highway or protect the victims. Gatestone was told upon further queries, that there was no official statement from the police or the ministry, just the drivers' statements. Maria Polizoidou, a reporter, broadcast journalist, and consultant on international and foreign affairs, is based in Greece. She has a post-graduate degree in "Geopolitics and Security Issues in the Islamic complex of Turkey and Middle East" from the University of Athens. Same in USA...making a fortune putting them in jails and detention centers! SEND THEM ALL BACK AND SLAM OUR BORDER DOORS SHUT!